Let's peel some remote apps. Over the years, Peel Remote app has deteriorated from one of the top universal remote apps to the one the most wicked Android apps. Yet, a few device manufacturers have the audacity to include it on the device as a pre-loaded app. In the early days, when the concept of “universal remote in Android phone” was still new, Peel Smart Remote app gained up immense popularity among the tech enthusiasts. Initially launched in 2009, the Android app gained 25 million users in only in a few years. Furthermore, collaborations with smartphone manufacturers like Samsung and HTC, quickly turned it one of the most downloaded smart remote apps, with a user base of 70 million. However, the app has been strongly criticized for many reasons. 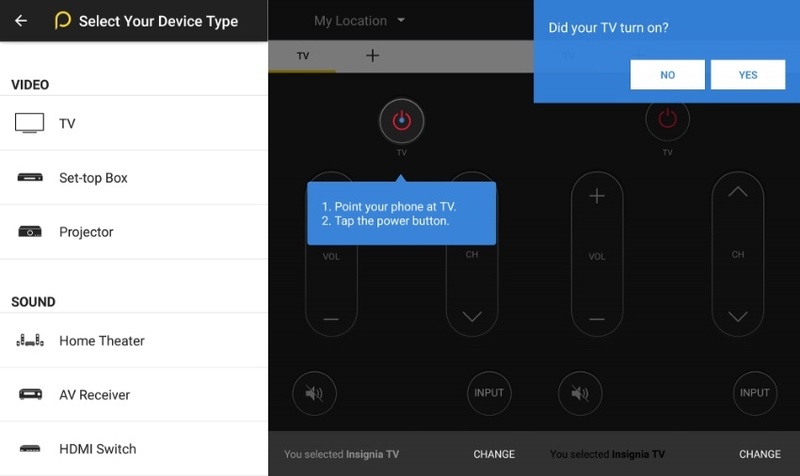 Apart from using wicked techniques to keep it running in the background, the Samsung TV remote app blasted users with lock screen ads and overlays. Although, the company tossed an option in the settings menu to switch it off, the half-hearted step still didn’t resolve many problems with the Peel Remote App. 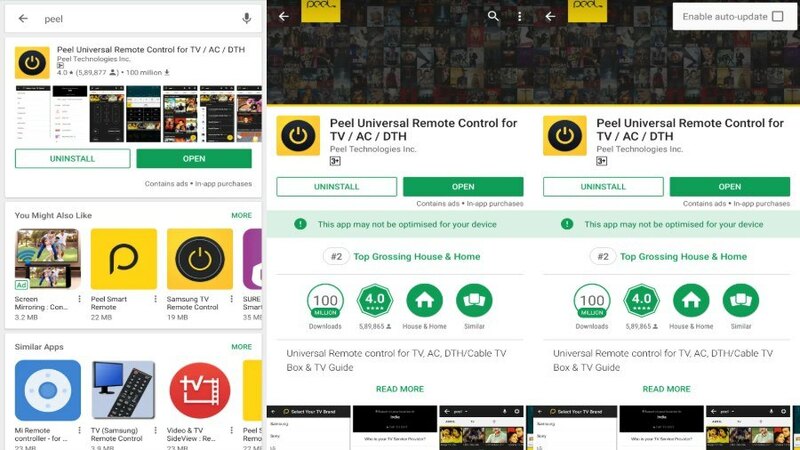 What exactly is Peel Smart Remote App? 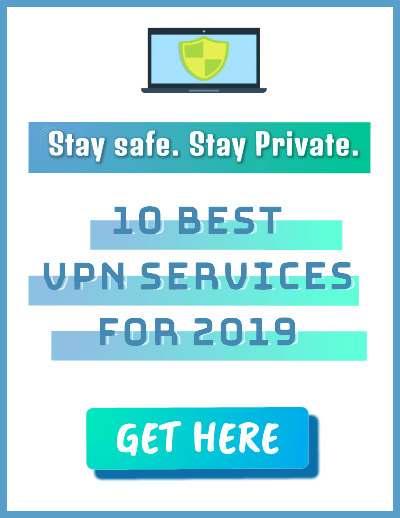 It is a universal smart remote app that primarily turns your smartphone into an all-in-one remote, i.e., allowing you to control appliances like Television, Air-Conditioner, Setup boxes and even gadgets like Roku, and few smart devices as well. The remote app uses the inbuilt IR blaster, available only in a few smartphones, which then turns your smartphone into a universal remote. Alternatively, WiFI can also be used to control a few supported devices. The graphical interface makes the application easy to navigate through the different sections. Especially, switching between channels and guides is seamless. The TV guide helps you choose between different genre shows and episodes. You can look for “what’s trending” and “recently watched.” The guide showcase information about the following shows and even offers you personalized recommendations. Remotes available in the app feature all the buttons, similar to a physical remote, thus making it easy to change channels at an instant. You can also have a custom remote and add your own channels. The app also allows you to directly cast YouTube content for live streaming devices like Roku and Chromecast. 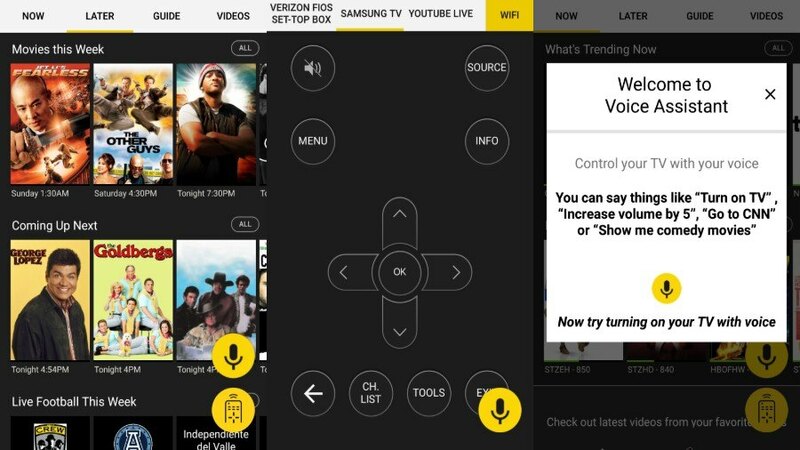 The voice assistant within the app can help you control the basic functions of your television, like “Turn on TV” or “increase volume by 10.” But this only works with a few televisions. 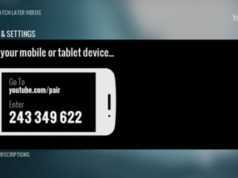 How to Add a Device In Peel remote app? A universal smart remote app mainly uses the IR blaster a.k.a infrared blaster to control all electronics. 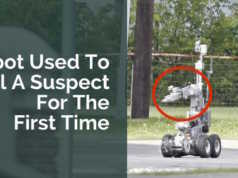 It’s a smartphone sensor found in few devices that emulates remotes of electronics such as a T.V remote, A.C remote etc. Point your phone towards the gadget and tap on the power button to test if it’s turning on. Once you set up the buttons, you can now freely use your Android Remote for controlling your TV or any other device. If initial button testing does not work, you can check for alternative buttons until you encounter a working one. Once you have set up a single device, you can also add more devices to the same location. Just tap on to the Plus button just below your WiFi name. 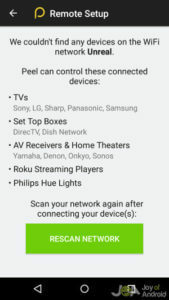 Peel remote even works for devices which don’t have IR technology, through WiFi. So when you launch the app, it will come with a pop up initializing the WiFi device setup. As of now, there are only a few devices which can be controlled via WiFi. 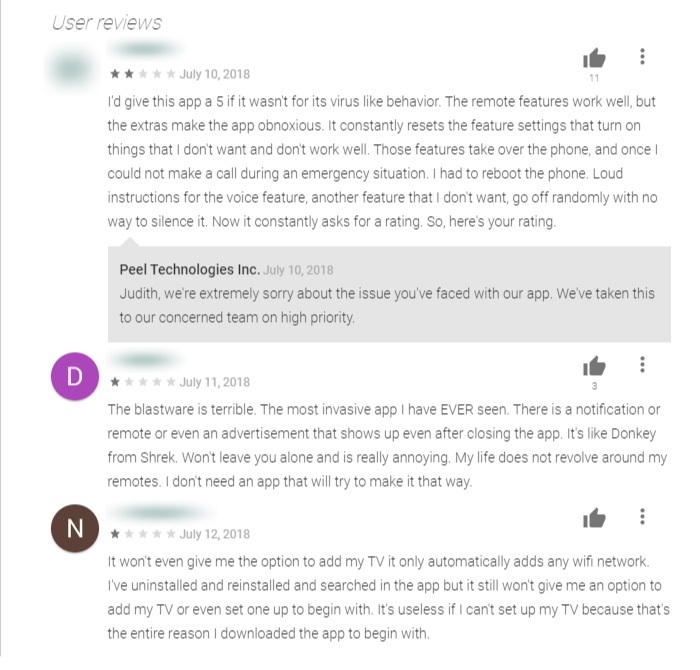 Why Peel Smart Remote App is criticized? 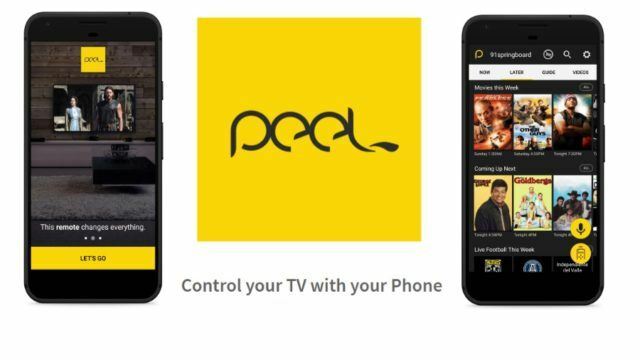 Truth be told, Peel Remote has been scrutinized for more than a year because of the company desperate measure to gain revenue. In 2017, the app introduced a malign ad practice of unethical lock screen ads and overlays. The application started placing ads over lock screen without any consent. As a result, people got frustrated because they always saw an ad whenever they unlocked their phone. Shockingly, the app didn’t provide any option to turn it off. How to remove the Peel Remote App? Another reason why people despise the Samsung smart remote app is that of its bloatware nature. Smartphones, which come pre-installed with peel remote virus, don’t let users remove the Android app through regular means. The only option available is to disable it, but people have reported that the app manages to resurface. Go to App setting in your Android smartphone settings menu. Look for “Peel Remote app” in the App Manager. 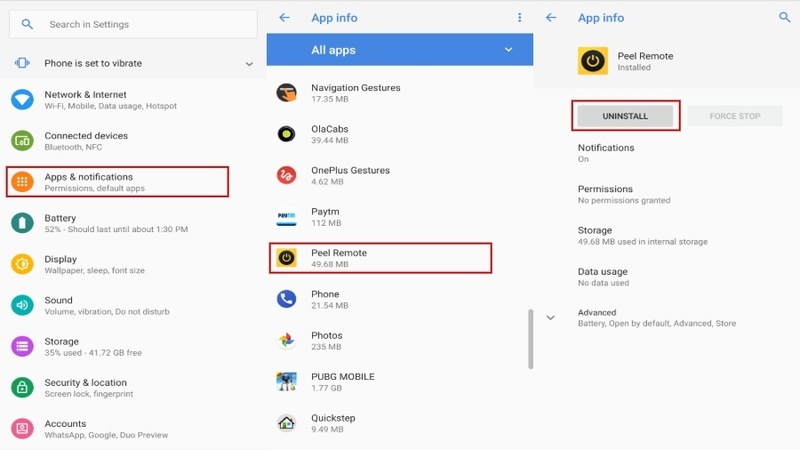 If the “Uninstall” button is available, select it to delete Peel remote app from your device. But if the Uninstall button is missing, select the “Disable” button to disable the app. The disable function will remove the app from the app drawer. Tap on the vertical three-dot button on the top right. Disable the automatic update for the app by not selecting the ‘Enable auto update’ checkbox. While there is no Universal remote app for Android that is as bad as the Peel Remote, there are a few who are following the same ugly techniques like bombarding ads, taking chunks of memory and much more.